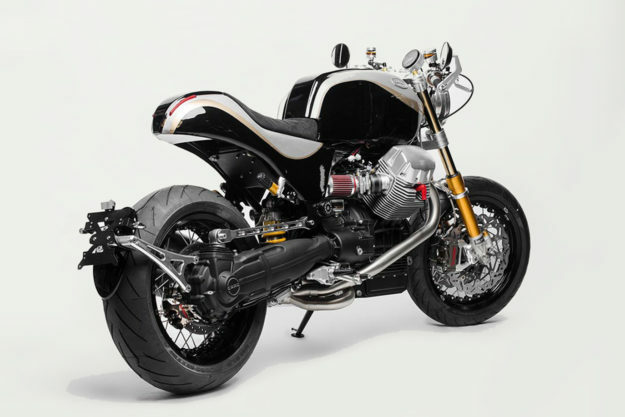 Moto Guzzi’s Bellagio gets a glamorous new set of clothes. Vladimir Putin gets a new motorcycle, with a little help from Kalashnikov. 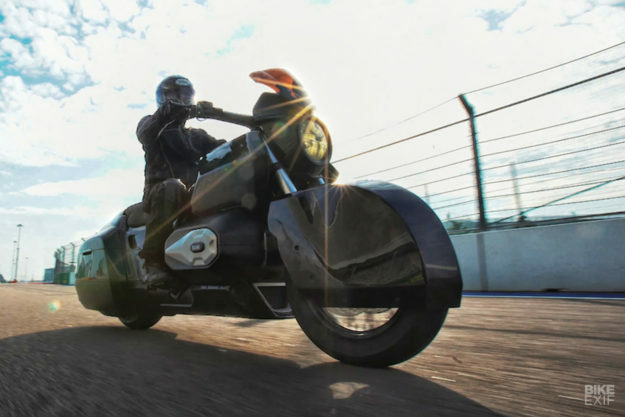 And the French photographer and racer Dimitri Coste gets acquainted with the Indian FTR1200 prototype. It’s been a pick’n’mix kinda week. Rostec Izh concept Ever wondered what bike Vladimir Putin would ride, when he’s not shirtless on a horse? Wonder no longer. 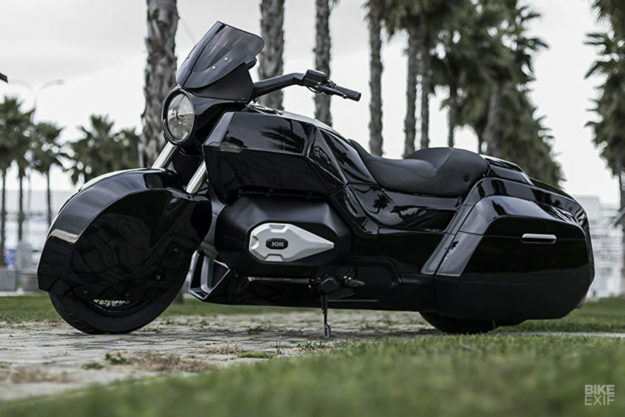 The Izh is a concept motorcycle developed by the Russian corporate juggernaut Rostec and the makers of everyone’s favorite assault rifle, Kalashnikov. With a nine-and-a-half foot long wheelbase and a curb weight of 1,124 pounds (510 kg), the Izh probably isn’t the most nimble of machines. 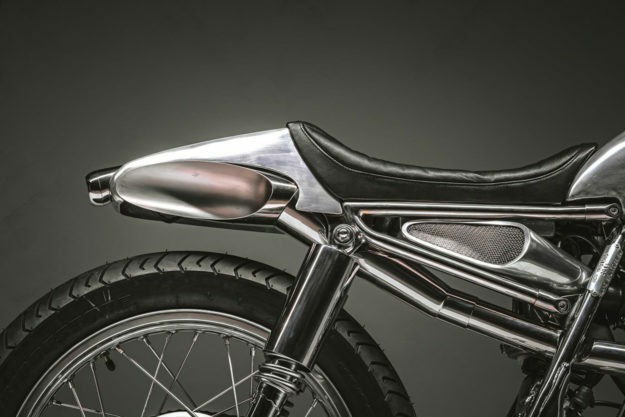 You may be thinking it’s because in Soviet Russia, bike rides you—but the extra payload comes from bodywork designed to stop bullets. Which seems unnecessary, since the rider is still fully exposed but looks and sounds as badass as Ivan Drago with a broadsword. Despite this, Kalashnikov cites a 0-60 mph time of an impressive 3.5 seconds: at 133 lbs-ft, there’s enough torque to uproot a Siberian Elm. They also claim 250 kph (155 mph) as the top speed for this beast, so we hope the binders are well in check too. Moto Guzzi Bellagio by South Garage The crew at Milan-based South Garage has a reputation for subtlety: a nip here, a tuck there and smooth lines everywhere else. Their sublime creations exude style and attention to detail, and really grab the peepers around here. 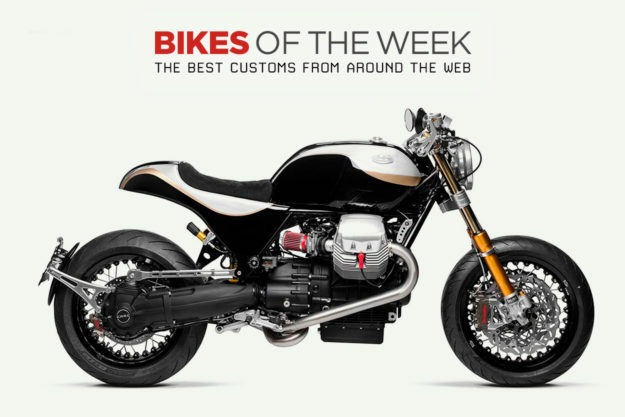 The Phoenix is SG’s take on the Moto Guzzi Bellagio, Mandello del Lario’s cruiser-ish roadster from about a decade ago. The Bellagio’s shortcomings stemmed from odd proportions, so SG went to work in the fabrication shop to right those wrongs. 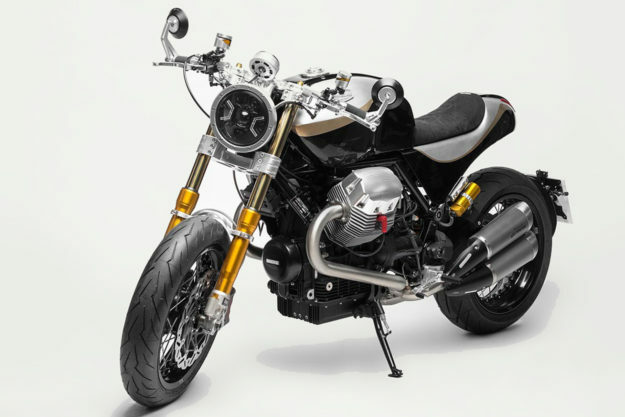 The new tank is a handmade aluminum unit, sculpted to look at home in a Guzzi showroom, and the rear is now a hand-laid, one-piece carbon fiber unit topped with an Alcantara seat. The visual change is utterly sublime and suits the bruiser stance to a T.
Suzuki Katana by Team Kagayama If you wanna see Chris, Wes and I nod in unison, roll up on a Hans Muth-designed first gen Katana. 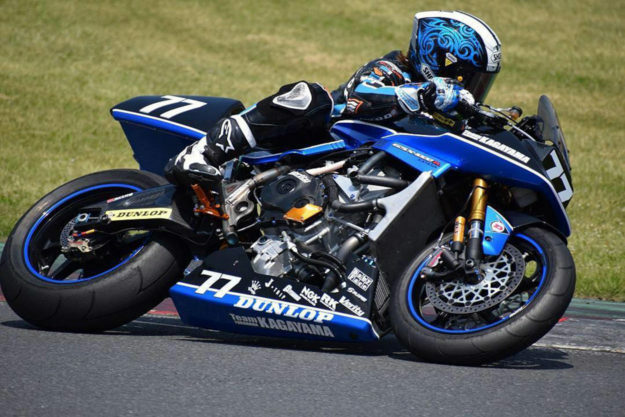 If you wanna see us start to salivate, roll up on this one—a race ready custom with the powerplant from a 185 hp Gixxer Thou. This jaw dropping piece of 80s nostalgia is the creation of the Team Kagayama racing outfit, and the goal of team boss Yukio Kagayama is to win the ‘Taste of Tsukuba’ race. But there’s much more at play than a simple engine swap. 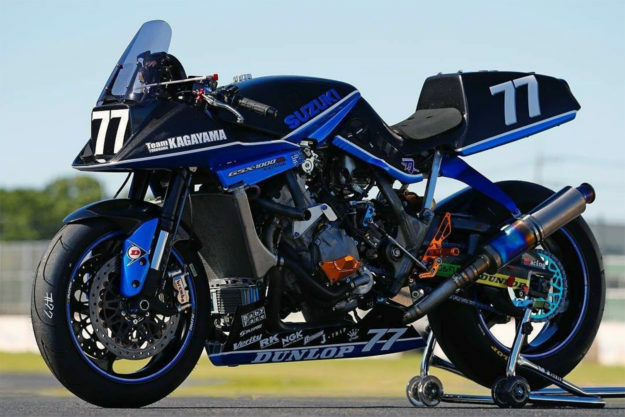 The GSX-R1000 needed a full suite of custom electrical work to make everything communicate, and the lower half of the frame had to be custom built to fit the new motor and beef up rigidity for race duty. 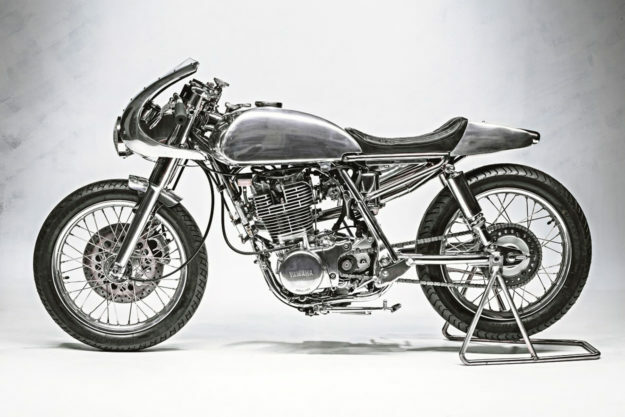 Yamaha SR400 by Benjies Cafe Racer Unfortunately, for most of us, lane splitting is a two-wheeled advantage we just can’t exploit. Despite the many documented benefits for traffic flow and rider safety, most legislation simply won’t follow the logic. But that didn’t stop Benjie Flipprboi from creating this lithe traffic scalpel when a local Yamaha dealer tapped him for a custom creation. 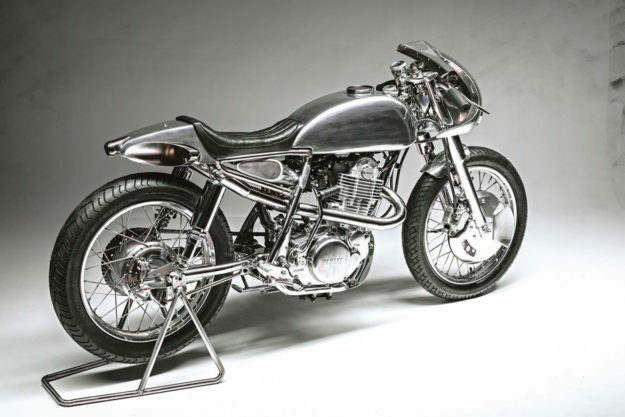 ‘Lane Splitter 54’ is based on a 2016 Yamaha SR400, and its width has been shaved to a slender 54 centimeters (21 inches). The work began with ditching the SR’s subframe, as the stock unit was just too bulky to get where Benjie wanted. A stainless steel tail and seat assembly was fabricated and mounted on the new, elevated perch. The metalwork is spot on and the custom exhaust exits through the tail unit. 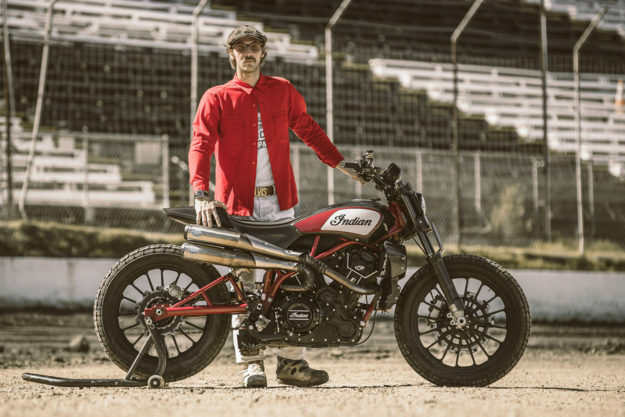 Dimitri Coste rides the Indian FTR1200 Every enthusiast with petrol pulsing through their veins must be waiting with bated breath for Indian to finally pull the wraps off the civilian-spec FTR1200. 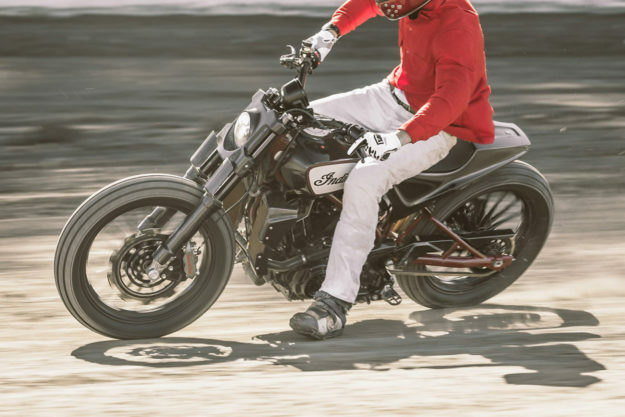 This pending street-tracker, provided it comes from the same mold as the prototype, is the exact weapon Indian needs to grab the extra market share it fervently desires. And just to make sure we’re all still paying attention, they’ve loaned a prototype out to photographer Dimitri Coste.